The more living patterns there are in a place -- a room, a building, or a town -- the more it comes to life as an entirety, the more it glows, the more it has that self-maintaining fire which is the quality without a name. And when a building has this fire, then it becomes a part of nature. Like ocean waves, or blades of grass, its parts are governed by the endless play of repetition and variety created in the presence of the fact that all things pass. This is the quality itself. Fun fact: This book has served as inspiration for many a web developer and programmer. I'm sure it's applicable to a lot of other things too. Thanks Milan for the recommendation. 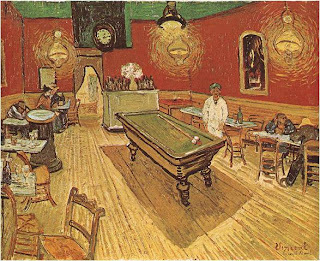 About the image: Le Café de Nuit, Place Lamartine, Arles (1888); Vincent Van Gogh.